I also got 2 other pairs of jeans, all different styles, but all the same size. The first pair was ok - I'll keep them because they were only $19.99, the other pair I couldn't even zip up. Very fashionable and economical! I also am 5'10 and have so much trouble finding jeans that fit. Nice FYI. Oh! Thanks for the tip!! 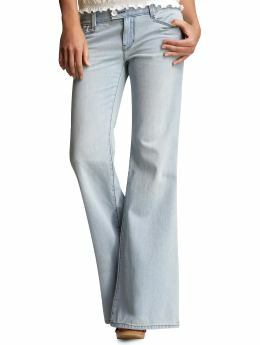 You should check out BCBG jeans...I used to work there at Easton in Columbus and they are very long. You could find them online if you don't have one near you! But I really like them. I wish I had that problem. I'm only 5 foot four, and if I could change anything about my body, it would be my height. UGH! Jean shopping is the one way to put me in a bad mood and make me feel really bad about myself. Those jeans were super cute. I bet you look great in them. why is it that jeans are so hard to fit?!?! I always have trouble with the low ones. Thanks for the tip - I have such a hard time with jeans. Nice to know I'm not alone. I dread jean shopping. Good for you for finding some that fit. Girl you would look fantastic in a flour sack! How's Miss Ruby doing? Emma and I remembered her in our nighttime prayers.